In the highly consolidated global ophthalmic ultrasound device market, the top five players represented nearly 72.0% of the overall revenue generation. These frontrunners are Ellex Medical Lasers Ltd., Nidek Co. Ltd., Quantel Medical, Halma Plc, and Optos Pic. The presence of a large number of small scale and large scale companies also renders the market highly competitive, observes TMR in a new study. “The dominance of the leading players can be attributed to their diversified product portfolio, extensive geographical presence, product innovation, and acquisition strategies,” says TMR’s lead analyst. 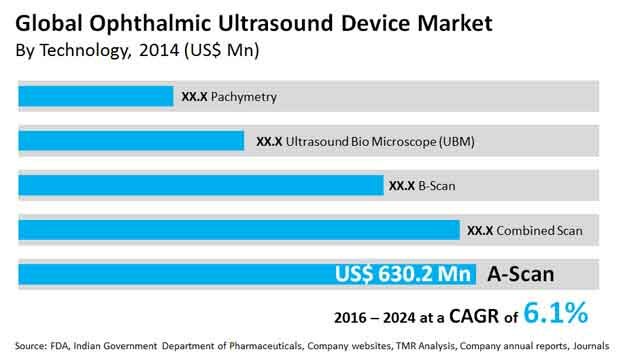 The valuation of the global ophthalmic ultrasound device market was US$2.51 bn in 2016 and is estimated to reach US$4.03 bn by 2024, progressing at a CAGR of 6.1% therein. On the basis of product, the A-scan segment will continue to dominate the market until 2024, accounting for 28.6% of the overall market value. The growth of the segment can be attributed to the growing geriatric population and increasing number of cataract patients. On the other hand, combined scan will register a CAGR higher than any other segment during the same period. North America will be the leading regional market until 2024. The burgeoning demand for modern ophthalmic ultrasound devices and increasing investments by manufacturers are providing a fillip to the growth of the region. Asia Pacific is anticipated to exhibit a CAGR of 6.9% during the forecast period, owing to the improving healthcare infrastructure. The increasing prevalence of ocular disorders is the primary factors driving the global ophthalmic ultrasound device market. “Cataract and glaucoma are few of the increasing disorders that have a significant impact on the daily lives of the patients,” says a TMR analyst. In addition, the widening base of geriatric population across the world is working in favor of the market since these people are highly prone to eye-related disorders. Moreover, the increasing prevalence cataract is prompting governments to initiate cataract awareness programs. These programs are helpful in educating people about corrective measures, which in turn is providing a significant boost to the demand for ophthalmic ultrasound devices. Furthermore, the introduction of novel ophthalmic technologies, which have greater imaging reliability, accuracy, safety, and minimal post-operative pain, is stoking the growth of the market. The demand for efficient diagnostic devices is on a rise. The development of these devices is capital intensive, which induces manufacturers to increase the cost of final product. The delay in regulatory approvals further increases the price. Hence, the high costs of these devices are hampering the growth of the global ophthalmic ultrasound device market. The dearth of ophthalmologists is also negatively impacting the growth of the market. However, market players are likely to capitalize the immense potential in emerging regions such as Asia Pacific and Latin America to maximize their revenue generation. “Massive consumer base coupled with augmented increased healthcare expenditure and a paradigm shift observed in patients’ inclination toward improved healthcare facilities make emerging regions attractive for investments,” says an analyst.